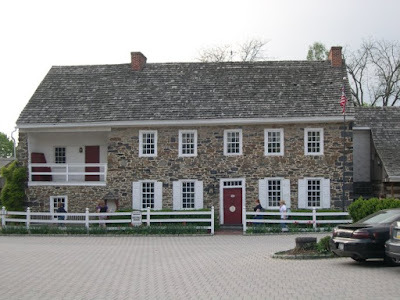 This first shot is of the Dobbin House built in 1776. Great food, by the way. 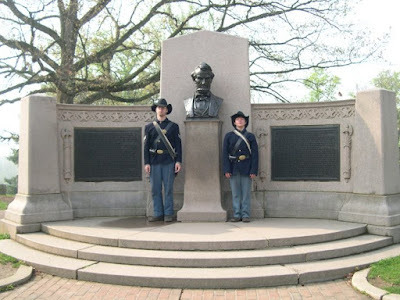 Tom and Rob at the Lincoln shrine in the National cemetery. 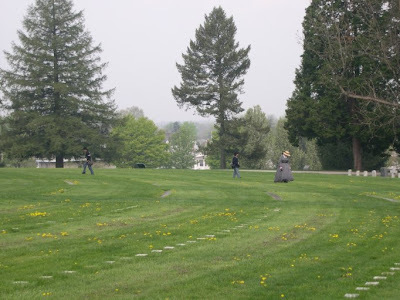 This is the cemetery where President Lincoln gave his infamous Gettysburg Address. 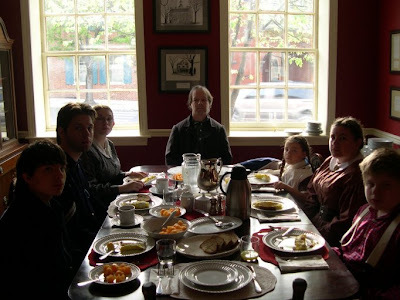 Here is a photo of all of us at breakfast in the Tillie Pierce House. The food was awesome! 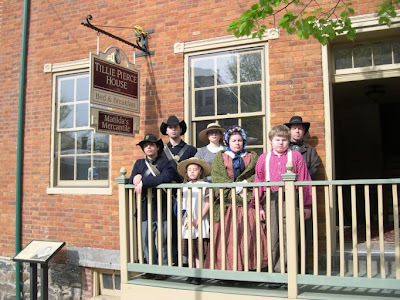 Another shot of mia famiglia, this time in front of the Tillie Pierce House. 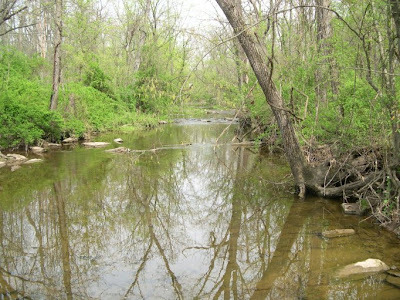 This next pic is was taken at Willoughby Run, on the west end of Reynolds Woods. There's a lot that happened here in this stream - too much to write at this time. Look it up - fascinating stuff. 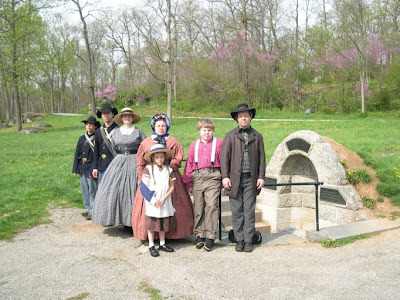 Spangler Spring supplied both the north and south with much needed fresh water. It's located at the foot of Culp's Hill. By the way, if you haven't noticed, we all seem to wear our 'Civil War Faces' when having our images taken while in period clothing. It's a habit. We all had a fantastic time. Really. 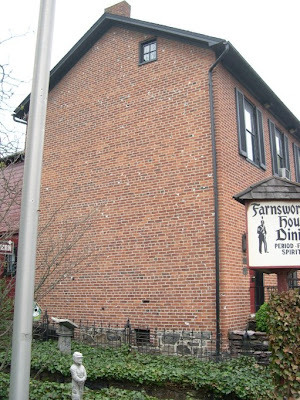 Here is the famous Farnsworth House - known in 1863 as the Sweney House - where a Reb sharpshooter reportedly shot Ginny Wade from the garret window. Notice the more than 100 bullet markings (in white) on the side. I have tons of photos of Gettysburg. I will probably post more in a future blog. I highly recommend a visit to Gettysburg when the opportunity allows. Truly an awesome historical place. Just came over at your invitation from Mike's Blog. You've got a really nice one here! 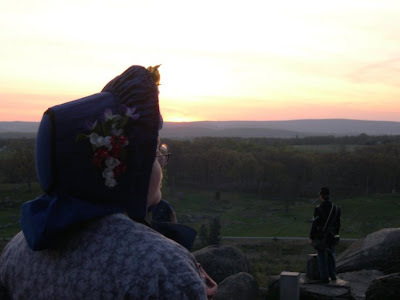 Wonderful Pictures of Gettysburg. I should go sometime. My home here in Mich is nearly 150 years old. When I talk about it to people I always reference the Civil War as perspective. I -still- don't comprehend the idea of a civil war here. Thanks for sharing your passion and letting the rest of us in on the most significant period of our country.